Sean Luong loving November CARE Month! Varsity Song Team at USA nationals at Anaheim Convention center! EHS Competitive Cheer CIF championship, earning runner up in Division 1A! Good Job Charger Girls! Another great year for the Resolution Run! Congratulations Jason Ross-named ACSA Secondary Co-Administrator of the Year for Region 17! Cream Puff Swans filled with ganache & whip cream by Ms. Richters 0 period Baking and Pastry Fundamentals Class! 70 STUDENT VOLUNTEERS AT THE HB COLOR RUN! ASE STUDENTS BUILDING SUSTAINABLE PLANTERS! Thank you to our SAC Recycling Crew! MUN Students at conference at Rutgers University! Great job Chargers! Jeff Lam, Co-Race Director and Expo Coordinator killin' it , announcing at the Resolution Run! Girls LAX enjoying their well earned pizza party from the Resolution Run Team Challenge. Way to go Charger Girls! HIGH 5 CELEBRATION FOR STUDENTS SCORING A 5 AP TESTS! Science students working hard in Ms. Hatfield's class! Edison Students taking part in "Walk a Day" activities during CARE Month. Did someone say dress up day? Ms. Lawlor is "All In!" 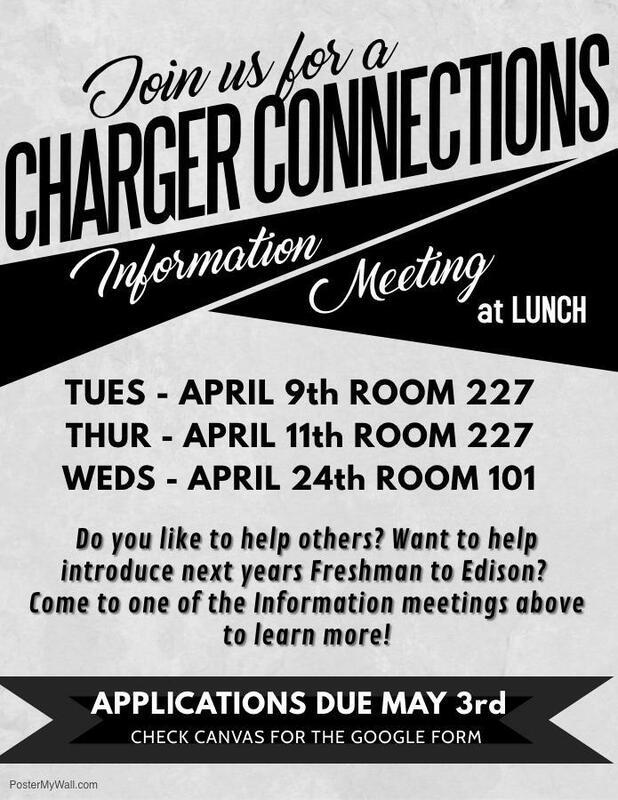 Thinking About Joining Charger Connections?!?!?!?! Attend the information meetings. Detail here! 8TH GRADE COURSE SELECTION - DATE, TIME AND LOCATION INFO. Welcome Class 2023! Information you need for a smooth transition here! Get all the info you need to have a rockin' great time!